Water temperatures are beginning to warm up. Snaggers have been having success on lower Truman Lake and Lake of the Ozarks, and we’ve seen a few fish move up the Marais des Cygnes River. There is flow on Truman Lake; water levels on the upper Truman have been coming down. They haven’t been releasing water from Truman Dam so there is very little flow on Lake of the Ozarks. They are continuing with minimum releases from Bagnell Dam. The fish are scattered out, with most of the harvest in the lower lakes. Most of the fish that they are harvesting are 36-40 inches and in good condition. We are beginning to see the occasional large female harvested. We’re still seeing fish harvested on the Osage River below Bagnell Dam. When flooding on the Missouri River comes down, they will begin releasing more water at both Truman and Bagnell Dams. They are calling for rain this week, so no telling how this will affect flows and dam releases. Violations cited this past week include snagging in no snagging zone. We are continuing to see more bank snaggers. When operating a boat near bank snaggers please be conscientious of them. Please slow down and give them space; running into their line risks pulling them into the water. Everyone needs to stay safe. When snagging on private property be sure to obtain permission from the landowner. With the nice spring days, we’re seeing an increase in water temperature. 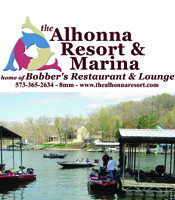 Water temperatures are in the low 50’s on upper Truman Lake and upper 40’s on Lake of the Ozarks. The Truman Lake water level is coming up since they have not been releasing water at Truman Dam. Lake of the Ozarks as fallen slightly, with minimal releases at Bagnell Dam. The very Lower Osage River is up with flood waters on the Missouri River backed up into the Lower Osage. When flooding on the Missouri River comes down, they will begin releasing more water at both Truman and Bagnell Dams. They are calling for releases from Truman Dam this weekend. However, the extended forecast is calling for more rain, so no telling what we will see – it will depend on how much rain we get. Truman Lake is up, several feet above normal pool. There is flow due to the high water in the upper basin that is coming down. Water levels at Taberville are coming down and are just below bank full flow. When flooding on the Missouri River comes down they will start minimum releases from the Dam. The water temperature is in the lower 50’s. Snagging has been good from Talley Bend to Osceola and as the water levels and flows come down we are beginning to see fish around Roscoe and Taberville. We’ve seen a few fish move up the Marais des Cygnes River. Snaggers are harvesting primarily small males and females (36-40 inches fish) and we’re beginning to see a few more of the larger females harvested. We’re seeing a few snaggers with limits. Snaggers are catching some sublegal fish (20-34 inch fish)., please be sure to release these fish unharmed immediately. Best guess. Early in the season the fish tend to be scattered out, snagging tends to be better lower in the lake – which is what we are seeing. As water levels and flows come down we are starting to see fish harvested around Roscoe and Taberville. The fish are beginning to shift upstream. Try the deep holes from Talley Bend area to Roscoe and above, moving further up towards Taberville as water levels and flows allow. With the high water there is a lot of logs and debris in the water, please use caution and stay safe. Crowes Crossing: go downstream towards Walker Hole/ Weaubleau Creek and below OR upstream towards Roscoe and/or go up the Sac River a couple of miles. Lake of the Ozarks is down slightly with the minimal releases at Bagnell Dam. When flooding comes down on the Missouri River the will start minimal releases from Truman Dam. The water temperature is in the low to upper 40’s at the surface. Snagging has been good on the lower Osage Arm and the Niangua Arm. Snaggers are harvesting primarily small males and females (36-40 inches fish). We’re seeing a few snaggers with limits and a few larger females. The fish are scattered out from MM50 up to the Highway 65 bridge (about MM 89.5); we are seeing more fish harvested below MM70. Snagging has been better lower in the lake MM50-MM65. Best guess. When the fish are scattered out, snagging tends to be better lower in the lake – which is what we are seeing. Try the deep holes from MM50 up to the Highway 65 Bridge. Snaggers typically have better luck lower in the lake try the deep holes below Wigwam School Access (MM66.2). When the flows increase, you may want to consider moving up higher in the lake, towards Highway 65. On the Upper Osage River below Bagnell Dam, a snag fishery exists for a few miles below the Highway 54 Bridge to RM78 (just past the golf course). The water level has fallen, and they are releasing minimal flows from Bagnell Dam. Snaggers are harvesting a few fish, primarily 26-30 inch fish and up to 35+ pounds.